The border crossing was easy. I was determined we would only pay 20USD (approx. 700Baht) for our visa and not 1,000 Baht several people requested. One had dire warnings of not being able to enter the country at all which we ignored. The main issue was finding the government visa counter. It is right next to the main gate into Cambodia, but we had to ask a few different people NOT the ones wanting to charge 1,000 Baht. I also had to find the Customs Office to declare the car. We could have brought anything into the country including the car and no-one would have known. However I am wary of bringing in a car without making sure of the formalities. Getting out again might be a problem. The Customs Official knew exactly what to do with the carnet, so I guess it was just as well. There were many men pushing and / or pulling heavy loaded carts through the border. I am not sure they were checked by Customs either. 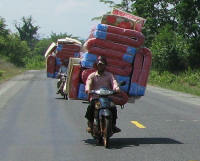 The goods seem to be offloaded in Poipet somewhere as they do not go further than the town. The various offices are in the middle of a town leaving the border wide open. The first building is a casino as was the third building. I do not remember seeing any casinos in Thailand but then I wasn't looking for them. Differences to Thailand - they drive on the wrong side of the road (the right hand side) so I have to get used to helping Pieter pass trucks again; Casinos at the border; election posters; very few villages and so far only one small town, Sisophon in the first 100 kilometres; The LP says that some people go through the town without realising it. I can relate to that. I was looking at road numbers and commented to Pieter that since the road numbers had changed the cluster of shops on a reasonable main street must have been Sisophon. Houses are built on stilts as in Thailand but the walls are made of woven palm leaves, plastic sheeting held in place with bamboo or corrugated iron not wood or bricks as in Thailand, although later we started to see wooden and brick houses; few garages as petrol is sold from the side of the road in old plastic cool drink bottles, great for motor bikes. We did find diesel from a pump and paid in USD; Cambodian currency is worth little, I bought a bottle of cold water using Baht with change in Riel. We have made a decision to put the Baht away and only use Dollars and Riel otherwise it will become just too confusing. In any case we will return to Thailand later. The road started out being in excellent condition. Then we came upon the work in progress. It was happening while the cars trucks and motorbikes were travelling along the same stretch of road. No detours except when they were building a bridge. You had to move over or be damaged by the machinery. We were sprayed several times with water. The water tanker drove along slowly while a man sat on top moving the hose from side to side to settle the dirt! I guess there is at least a water tanker. To be fair we later saw a more conventional water truck with water sprayed mechanically from the bottom. We spent the night under the cover of a closed petrol station which was part of a closed restaurant, lovely shade and protection from the rain which seemed about to come but never arrived. The restaurant was about to open for a month. They make enough money in one month to keep them going for the rest of the year! 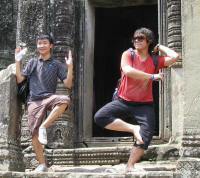 Siem Reap is the town near the ruins of Angkor Wat. We parked at the Angkor Shopping Centre for two nights but it was so hot from early in the morning to late at night that we decided to recuperate in a hotel for the rest of our stay in the town. The staff at the shopping centre were really nice people. They were very interested in the van and were pleased to be allowed inside to see it. We sat on chairs in the shade outside the building but even this was very hot so they gave us fans. When we left they made sure we had a full load of water including drinking water. During the morning, evening and night there were periods when the trees opposite were full of chirping sounds. We had come across this before as birds settled down at dusk for the night, but the sound came once only. Pieter had a good look at the tree and discovered they were large fruit bats. I had always thought bats like dark caves but these bats hung in the trees for a while then would go off foraging, come back and rest again all through the day and night. Newspapers are critical of the government. A karaoke star had acid poured on her face by her politician lover's wife 10 years ago. The warrant for arrest has still not been used. Scholarships to universities are being handed out. 10% to rural children in remote areas, 15% to poor children and the other 75%? The tribunal for trying those accused of war crimes during the time of the Khmer Rouge and then the Vietnam occupation has not really started. The positive side is that there is criticism in the press and the tribunal may start one day. The ruins have the composite name of Angkor Wat but in fact there are many Wats in the area, including one called Angkor Wat. 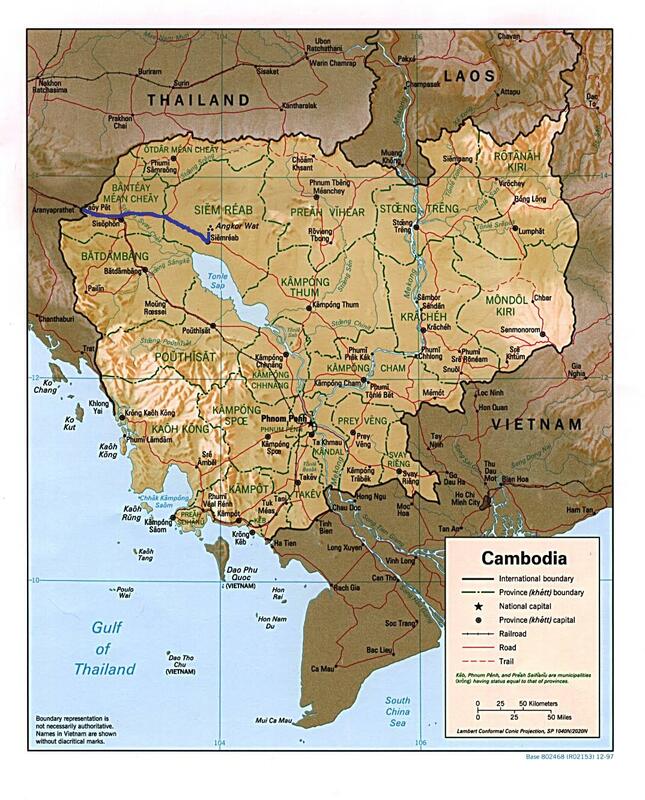 It was after all the centre of the Khmer Empire (802 to 1432) which extended from Thailand to Vietnam. 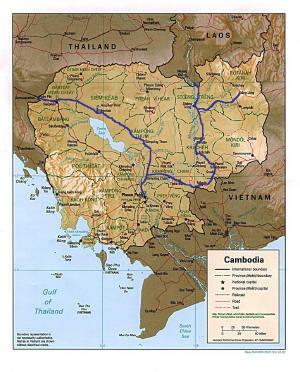 They cover an enormous area much larger than the town of Siem Reap. Just to give you an idea there are two basic circuits, a small circuit 17k long and a larger circuit covering some of the same ground, 26k long. The whole is breath-taking. There is so much detail that it is impossible to take it all in. We spent two mornings going over the main sights and that was almost too much for our brains to cope with. It is impossible to capture the magnificence photographically. They really have to be seen personally. The LP is right 'Prepare for divine inspiration'. The Wats were built by successive devaraja or god-kings trying to outdo the previous kings. Only the religious buildings remain as stone was reserved for the gods. Mortals lived in wooden buildings, including the kings, and these have long gone. Angkor Wat itself is the largest religious building in the world. It was built by Suryavarman ll (reigned 1112-52) in honour of Vishnu, his patron deity, and as his funerary temple. The design is based on the Hindu Universe with the 5 mountains of Meru where the Gods live in the centre on the highest level, the surrounding mountains (walls) then the infinite ocean (the moat). The grounds including the moat are about 1.5k square. The moat is wider than any I have seen, 200m. One of the reasons for having the large moat was to use it as a spirit level when building. The temple complex starts with the moat, a wall with an entrance hall, a large open area followed by the main building. This is built on 3 levels with towers on the four corners of the square and a higher central tower 55m high. Apparently the towers look like lotus buds from the air. Surrounding the main building are 800m of bas-reliefs therefore each side is over 200m wide as the bas-reliefs are under a covered balustrade. 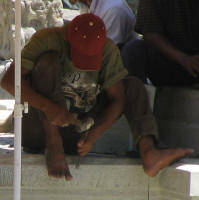 The temple was later converted into a Buddhist Temple and people still worship there. The original detailed carving is still visible in places. Some of it has been reconstructed after the destruction by time and humans such as the Khmer Rouge. 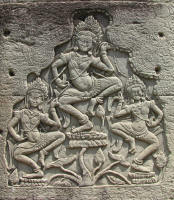 One of the main type of carvings are of apsara. There are 1850 carvings of these celestial female dancers. The complex is made from laterite brought from Phnom Kulen by boat. The covering is sandstone, similar to temples in Thailand. There are the usual photo opportunities. There was also a wedding party taking pre-wedding photos. A view showing 3 towers is part of the Cambodian flag. Ta Prohm has been used as a set for shooting both Tomb Raider and Two Brothers. To put it into the context of size the surrounding wall is1000m by 700m or about half the size of Angkor Wat. It has been left to nature unlike other temples where there has been reconstruction and restoration. This is changing though as a work group was there starting on reconstruction. It is the combination of neglect with some lovely carvings (including many Apsara) which gives it a special contemplative surreal atmosphere. Besides time and the weather most of the deterioration has been caused by the Spung Tree, Tetrameles Nudiflora Datiscaceae. Angkor Thom is a walled city built by Jayavarman Vll, (reigned 1181-1219) - after Angkor Wat. The walls are over 12km long, 6m high and 8m wide. There are 5 gates each with 4 faces of Avalokiteshvara. Since it was a city there were Wats and the palace. The religious buildings, walls and terraces have survived. The major sight in Angkor Thom is Bayon, built in the centre of the city around 1200, which has 216 giant faces of Avalokiteshvara on its 52 towers (for the main Khmer Empire towns) staring down at the visitors. Avalokiteshvara is a bodhisattva of infinite compassion and mercy. His name has been variously interpreted as “the lord who looks in every direction” and “the lord of what we see” (that is, the actual, created world). Certainly the images are looking everywhere. Legend has it that they look very much like Jayavarman Vll. There are 1200m of bas-reliefs, 50% longer than Angkor Wat. The ones I saw were of the army going to war with serious looks on their faces and accompanied by elephants. 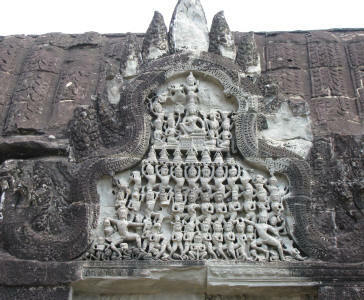 The main path from the wall to the temple is paved with a balustrade lined with demons on one side and devas (gods) on the other side holding onto the body of a Naga Serpent. This was the first time I saw a temple guardian, Kala. The temple guardian usually has pop eyes and no lower jaw. This is because he annoyed Shiva one day and was told by the angry god to eat himself. Shiva found him when he could eat no more of himself because he only had his upper jaw left, by then it was too late. There are two terraces fronting the palace area. The first is the 300m long Terrace of the Elephants because it shows elephants hunting on the bas-reliefs. The main steps leading to the palace are held up by garudas, human-birds which are the mount (or vehicle) of Vishnu, and 3 headed elephants, the mount of Indra God of the East, God of war and King of the Gods. The terrace was the main reviewing stand for the king. The Terrace of the Leper King is said to have been built by a king who died of leprosy. The front retaining walls are covered with 7 tiers of carvings. There is a trench behind this wall which was filled in when the terrace was enlarged. These carvings are still in excellent condition with lots of voluptuous women. Preah Khan is thought to have been a city with a Buddhist University. It is about the same size as Angkor Wat without the moat. It is built in a cruciform shape, aligned to the 4 cardinal points like Ta Phrom but shows this better because it is better preserved. There is a bridge over a moat with a Garuda backed by a Naga Serpent. On the backside of the serpent is thehead of another serpent. Gods and demons are holding the body of the serpent but this part is very badly preserved. Once again the carvings are marvellous. This time I saw a Temple Guardian before Shiva became angry. There are plenty of restaurants and food stalls throughout the area. Water was especially well received as it is so hot and humid. Baby comes along with their working mothers. Toilets are generally thrones but with a hose as well as paper for cleaning. I guess some people do not know how to use a throne and are much more comfortable with squatters. I would not have minded having a shower though. The Angkor National Museum is beautifully laid out with the exhibitions in air-conditioned rooms. It is the second time the no photo rule has been rigidly enforced. Bags large enough to hold a camera must be checked in. A small bag is given in exchange to allow you to take valuables with you i.e. money, passports and a note book and pen. There is a route to follow so that you pass through the halls logically. They cover the Khmer civilisation, religion and beliefs, Khmer great kings, Angkor Wat, Angkor Thom, ancient writings and costumes. There are plenty of English labels and explanations and the Hindu stories associated with the statues plus videos in many different languages - Khmer, English, French, German, Chinese, Japanese and other scripts I did not recognize. I also took an audio tape but this was not really needed as the explanations were so good. I tried a tamarind. They have several seeds like peas in a pod, covered by thick edible flesh. It has a sweet slightly sour taste. It is also a mild laxative! There is an Art Gallery, Red Gallery, featuring modern Khmer sculptures made from decommissioned weapons. We also saw monks from the local monastery going around requesting breakfast from the faithful. They are very respectful towards the monks and take the opportunity to pray to the Buddha in the monks. 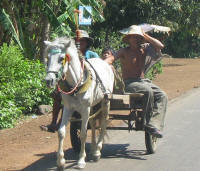 There were some horses and carts but these seem to be few and far between, overtaken by motor cycles. Once again road works were in progress near Phnom Penh. Nearing Phnom Penh the traffic became very thick. After sitting almost at a standstill for over half an hour we decided to turn back to a spot we had seen by the river. It is no fun arriving at dusk in a city you don't know. At least there no road works in progress today obviously because it was Saturday so it only took us half an hour to cross the bridge over the Tonle Sap into the city. It took over an hour to finally find a place to stay. The back streets are narrow with low hanging wires - not for us even though Pieter tried once or twice. The areas marked as park near lakes and rivers were also built up. After trying several places including at the side of Raffles Royal Hotel, we saw a parking area right opposite and went there. It was actually the National Library. During day a group had set up free enterprise paid parking just like happens in shopping centres in Johannesburg. A restaurant has also set up business in a corner of the grounds. The family run the restaurant and sleep in the back during the night. At night a shed holds the carts of the hawkers who have there stalls outside on the street. I had been feeling ill all day and spent the afternoon and the next day resting. Not a problem since it was Saturday and Sunday after all. On Monday we went to Laos Embassy to apply for visa - only it was actually Saturday. Where did I go wrong? At least it gave us the weekend to see some of the sights - very slowly as the weather was Hot Hot Hot, Humid Humid Humid! We did see the National Museum and Royal Palace. The Museum is smallish rather like a warehouse of statues but a pleasant outing. Near the palace there were many goodies for sale - beetles, grass hoppers of various sizes, birds of various sizes with only the feathers removed, snakes and tarantulas. The Palace was OK. It does not come up to the ornamentation of the Palace in Bangkok. There is a designated path through the grounds to prevent visitors from wandering into the residential areas where the king and his family live. The Palace was located in this spot in 1434 because it is at the junction of 4 rivers, the Upper Mekong, Lower Mekong, Tonle Sap and Tonle Bassac. The current buildings date from1866 and are concrete reproductions of the original wooden buildings following the Khmer style of architecture. They are coloured yellow for Buddhism and white for Brahmanism. The first building is the Throne Room guarded by Naga serpents and with the ceiling held up by Kinnoris birds and Garudas. The Silver Pagoda (Wat Preah Keo Morokot or the Pagoda of the Emerald Buddha) is unique. It was built in 1892 to allow royalty to listen to sermons on Ubosoth, the 8 precepts of Buddha. 5 are similar to the 10 commandments. Not to kill; not to steal; not to commit adultery; not to falsify; not to slander. The others are not to eat at the wrong time; to avoid worldly gifts and not to use ointments. The floor is covered with 5,329 silver tiles each weighing 1.125kg, most of which are covered with carpets for protection. It also contains a Green Crystal Buddha on a high gilded pedestal and a 90kg life size solid gold Buddha inlaid with 2086 diamonds, the largest being 25 carats. Nearby is a shrine dedicated to Nandi the bull and mount of Shiva. The bull is 80% silver with copper, lead, iron and zinc. Before leaving the palace compound you have to walk through a display of the coronation procession of King Norodom Sihamoni. He is the son of King Sihanouk who gave up the crown in 2006. Sihanouk supported the Khmer Rouge for a time. He is not the prime minister but I assume he has some power still. According to the cult of the god-king that has been worshipped from ancient times, the king to be had to perform ablutions blessed by a secular patriarch, his father and his mother. The holy water was brought by Brahmins from the river course of a thousand lingas of the god Vishnu from the peak of Mt Kulen, Cambodia's symbolic Ganges. Hinduism is definitely a part of Theravada Buddhism. It was a pleasant relaxing outing as there was lots of shade to sit under. The Silver Pagoda is enclosed by walls decorated with murals covering the Reamker, the Khmer version of the Ramayana. Scenes from war predominate and many are in poor condition. The library is near Wat Phnom, a nice outing as there are many trees. I did pick up some interesting information. Each day of the week has a colour associated with it. Both the King of Thailand and Pieter were born on a yellow day i.e. a Monday. Tuesday is violet (for my sister Carol); Wednesday is leaf red made by having the warp red and the weft green (for me); Thursday is green (for Pieter Frank); Friday is blue (for David); Saturday is purple and Sunday is red (for Pieter's sister Harjet). So now I know. Nandi the mount of Shiva was again being worshipped. The Tuol Sleng Genocide Museum is dedicated to those Cambodians tortured and killed in the former school by the Khmer Rouge. In 1976 there were 1684 staff members to 'attend' to the prisoners. Prisoner numbers started at 154 in 1975 reaching 5765 in 1978. 10,519 prisoners, excluding an estimated 20,000 children, are known to have passed through the prison. It contains many photos of the victims as the officers who ran the facility took photos of all those who entered. The cells for individuals are small but many were crowded into common rooms with no space to move at all. Several of the tortures used are described. I gather no-one left the facility alive and they were only killed once they had confessed in writing to the crime they had been accused of. There is a sign asking that loud voices should be avoided. It is not the sort of place where you want to laugh so the sign is superfluous. It did not have the same deep down revulsion that I felt when I visited Auschwitz 35 odd years ago, but it is still depressing. Apparently the Khmer Rouge killed about 2 million people throughout the country. They ruled from 1975 to 1979 but the trials for war crimes are only now starting amid much debate. Pol Pot is dead and cannot be tried. The city itself is a mixture of the old, the new, the under construction, the falling down and shacks. All parking seems to be taken over by small entrepreneurs. Tuk Tuks always ask 2 dollar even if they do not understand where you want to go. There are lots of beggars, Camreys and Land Cruisers. Definitely the very rich rub shoulders with the very poor who are in the majority. The middle class seems to be growing though and this will gradually filter down. Corruption is blamed for the slow pace by many Cambodians, none of whom would like to be named. I think the Vietnamese colonisation and ongoing conflict also have a part. The 2006 LP states that in the north land mines have been laid less than 10 years ago. We applied for the Laotian visa Monday and received it on Tuesday. For once I paid less than Pieter, must be because Australia is so close. We first went and bought spares for the Land Rover at a dealer just north of town and then spent the night back at our spot by the Mekong. This time we were prepared for a braai (bar-b-que). The weather is getting a little cooler with some rain. This means we do not sleep in a puddle of sweat! Today we headed for Kratie to see the fresh water Irrawaddy Dolphins. There were many sights that we had seen before, except now we took photos. 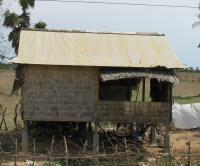 Houses are built on stilts and added to as the need arises. The building phases are to set up the support poles, usually concrete or wood. The supports for the raised floor are added to the sides and then the roof put on. Next comes the floor, the windows and lastly the walls. I suppose this makes sense in such a hot climate. At least there is shade from the roof for most of the construction. The wooden walls are not pushed tightly together which allows air to flow freely through the building, another great idea in the climate. Spirit Houses are found on most properties. They use paint for colour rather than coloured glass as in Thailand. This will come with greater wealth. The yam crop (my assumption that it is yam) has just been harvested. It is chopped up by the farmers and laid along the road to dry. They do lose some to cows and dogs though. Once it is dry it is placed in large bags and a truck comes along and presumably buys it. 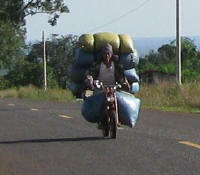 There were the usual overloaded motor bikes. 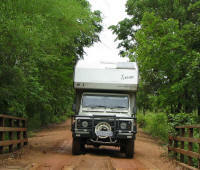 We found a really nice place to stay down a dirt track some distance from the road. A piece of flat wood had fallen off a load some time previously. Naturally Pieter cut it up as it will make excellent firewood. We took two motor cycles out to Kampi north of Kratie, to the area where you can hire boats to take you onto the Mekong in the hope of seeing the dolphins. Even though it was a cool day we waited till 16:00 to ensure it would be cool enough. Apparently the dolphins are not very active when it is hot. We saw plenty, some very close to the boat and some in pairs. Of course seeing is not the same as getting a photo. I was much more interested in just watching so I merely held the camera in the general direction and clicked away. Most of the photos ended in the trash bin. The dolphins only surface before going back down so the most you see is their back and sometimes the tail. Even so I enjoyed the experience. On the way back we stopped at Phnom Sambok, a Buddhist Monastery. There were two temples and outside one I came across 2 nuns dressed in white. Nuns are not very common. We also had to weave our way past a few celebrations where the tent covered half the road which was already barely wide enough for two cars to pass. The houses all had electricity and TVs. I am glad we stayed in a hotel as it rained heavily both nights and besides the leak over Pieter's side of the bed one has developed on my side. We really need to buy a ladder so they can be repaired. The original ladder was lost somewhere in India. The road north went through Kampi where we noticed a possible parking/camping spot just to the north near a village built over the water. We turned off the NH7 (main road north) onto the NH78 to visit a less touristy part of Cambodia. The road was well graded dirt and easy to drive on. There were many small wooden bridges with a 10 tonne limit plus one large single lane bridge. There is a lot of natural forest although some of it is being cleared for cultivation. Water was pumped by hand, cell phone coverage is good and petrol for motor bikes is dispensed from small petrol pumps. These petrol pumps are found everywhere and are a form of private enterprise. Once again we found a lovely spot behind a hedge away from the road. It was probably private property as there was a locked shed there. During the night the rain poured down resulting in a horrible mud road. The cars and motor bikes were driving very carefully, even so we helped one car to get out of the ditch. Silly man braked before Pieter stopped so he probably lost his tow connection. How he expected to stop a 3.5 tonne van with a puny little car I don't know, maybe he didn't think it through. At least no-one was near the tow rope when it came loose, the whiplash could cause a nasty injury. 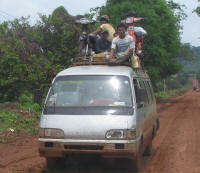 Ban Lung is a small provincial town even though it is the capital of a province. The market was in full swing when we arrived so we picked up some fruit and bread while delicately trying to avoid walking in the mud. I gave up when a motor bike drove past on the narrow passage between the stalls and splashed mud up to my knees. It was strange to be given prices in Riel and not dollars, although they did accept dollars. Lunch was a choose and point affair as English is not common. I ended up with vegetable soup with offal. Not too bad but it would not be my normal choice. After lunch we headed out to the crater lake where we were allowed to stay overnight for the price of the daily entrance fee. 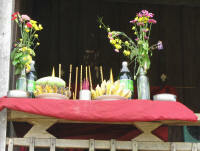 Tuesday was the start of the Buddhist and therefore the Khmer New Year. The parking area was crowded as people arrived by the bakkie (utility, pickup) load and overloaded motor bikes. The lake was also crowded around the edges. People swim in their clothes as in many countries, although I noticed several had dry clothes to change into. Not many can actually swim either, they stay close to the platforms provided or near the edge of the lake. Needless to say the edge of the lake became very muddy. They all had a picnic lunch and left the rubbish behind. Next morning quite a bit had been cleaned up though. Happy New Year! It goes on for 3 days in Cambodia. On the way back to the NH7 we were covered with powder twice and Pieter was given some rice wine. At least we did not have water thrown at us. The road was half dry but the traffic and recent mud from the rain left lots of potholes and ripples on the surface. We were glad to be back on the tar. And for the first time we had the car cleaned by professionals. Unfortunately the car was so dirty they didn't get it perfect but it looked much better. I managed to take a photo of water buffaloes wallowing in muddy water. This is a common sight throughout the Indian sub-continent as well as South East Asia. Cambodian restaurants can serve really great tasty meals usually in tourist areas or they can be tasteless with very little meat or vegetables. We often went to restaurants as it is more expensive on the whole to buy the ingredients to make your own. Unfortunately in the last few days we had had poor meals. Maybe Laos will be better. Women seem to be very vocal generally and often seem to be in charge of businesses. Although men are dominant in politics it seems women have quite a lot of influence. Certainly they are not shy and retiring. One comment on the Phnom Penh Post dated 8 April. It had 26 pages, 3 covering sport, 4 covering property, 4 covering business, 4 covering world news of which .25 of a page was devoted to slamming the dropping of corruption charges against Zuma and 1 Opinion page, half of which slammed Zuma under the heading 'No way to run a democracy - the decision to drop corruption charges against Zuma is a bad omen for South Africa's future'. So almost 3% of the paper was devoted to slamming Zuma and this in a small country halfway around the world. What will become of South Africa if Zuma becomes president?